Week One of Project Gastronome went well! I've had some very fun feedback and participation from many of you, and I'm looking forward to our second week of dietary excitement. Last week I worked out my canines with foods from the Animal Kingdom; this week it's time to get the molars in on the act with foods from the Vegetable Kingdom. When I was in college, I dated this girl whose dad's job with Mobil Oil had relocated them all over the world. She had graduated from high school in Indonesia, and told me about a fruit which was really popular in Southeast Asia. Although she'd never tried it herself and couldn't remember the name, the flavor was supposed to be phenomenal. What had made it stand out in her memory, though, was its odor, which she described as being so pungent that it was often banned in public places. My curiosity was piqued, but without more details to go on, I put it out of my mind. 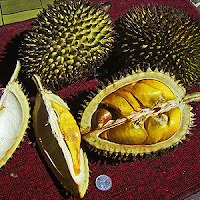 That was the mid '90s, before you could Google a phrase like "stinky fruit banned in public" and instantly learn that your girlfriend was talking about the fruit called durian. It is known principally for the two things I mentioned above, its allegedly heavenly taste and custard-like texture (which has earned it the revered title of "King of Fruits") and its allegedly hellish smell. There are many, many stories on the web about people trying durian, but a really good one ran on Salon just as I was getting ready to launch this project, titled Durian: The King of Fruits is an angry king. The novelist Anthony Burgess (best known for the book A Clockwork Orange) described it as "like eating sweet raspberry blancmange in the lavatory." Clearly, this is a food that people have a love/hate relationship with. 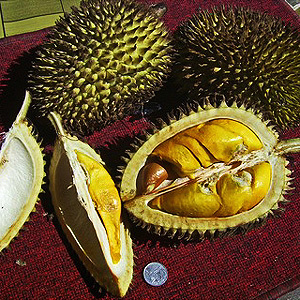 Here is a picture of the noble durian, with sharp spikes on its outside, trying to warn you not to eat it. Also, here is a sign forbidding you to eat it in public in Singapore. When I started Project Gastronome, this was one of the foods that I most wanted to include, but was also least certain I'd be able to obtain. It was one of the foods that I specifically had in mind when I visited the Far East Supermarket. I know I've already mentioned this, but the lady who helped me that day, Nancy, was so incredibly friendly. The only moment she looked at me like the idiot that I am was when I asked her if it was possible to get fresh durian. I wanted the experience of actually cutting one of these suckers open. As it turns out, though, durian is only in season for a brief period during the summer, so I had to settle for frozen, packaged durian. If I'm being honest with myself, that's probably the best option for a lazy American gourmand. I asked her if I needed to thaw it or prepare it at all, and she told me, "Nope, just take a spoon and eat it like ice cream!" I asked if the smell was as bad as I'd heard, and she said, "No! It's a natural smell. An earthy smell." Yeah, well, horse manure has a natural, earthy smell, too, but I'm not going to eat it with a spoon, sister. Courtney banished us outside to eat this one, which was the right call. Opening the container instantly released a smell so tangy and putrid that it was like finding a dead animal on a hot day. It was as though the fruit itself was saying to me, "You think you're gonna eat me, mofo? Good luck with that." This, I told myself, was the part to be powered through, so that I could be rewarded by the taste. Actually, let's run with that reward metaphor for a minute. Imagine, for instance, that you have just won the Academy Award. You're wearing a suit that makes you look the best you've ever looked. You walk up to the podium and are gently, but sexily, kissed on the cheek by Charlize Theron. Aw yeah... That is the experience I had hoped for with durian. The experience I received was more like being told to approach the bench to hear your sentence, while being dressed in burlap, and getting kicked in the nuts by Jet Li. I see now why people have such a difficult time describing it. The flavor actually started out OK! It had the feel and some of the taste of a light melon, like honeydew, but with some pineapple-citrus notes, too. It even kind of effervesced in my mouth a little. But then it started to grow in my mouth, and felt as though it was releasing some kind of vapors. Flammable vapors. Not like my mouth was on fire, but like my mouth was full of the kind of chemicals that people use when they want to burn something. Also, in case you didn't see it this weekend, don't miss your chance to attend the Look What Danny Made! Project Gastronome wrap party! Even Courtney is going to be there, so you know that I'm not going to force you to eat anything gross. For details on how you can be a part of it, please see this post. I hope you'll be there! Man I was excited to see that you tried during. My husband is half Thai and has been to Thailand many times with his mother. For years I have had to endure countless ravings about how disgusting it is and their opinion of those who like it. 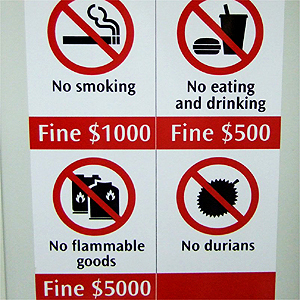 "You are what you eat" is apparently true of durian. So last summer we went to the Asian Market in Arlington and as soon as we got out of the car, Marcus was ill. He could smell the fruit they were cutting up from OUTSIDE the store. So of course he can't wait to see my reaction when we go inside because he is just overwhelmed with the smell. But I thought it smelled mild and fruity. So we went inside and got some samples. Actually a sample, and then another, and then another. I couldn't get enough. It was so good. Like bananas but citrusy. He was GAGGING just watching me. So after much discussion and some further research here is our conclusion: It is genetic. Marcus knows of my hair-pin gag reflex that is triggered by things like cat puke and soggy croutouns and is convinced that I would not volutarily eat something so nasty. But we found some research that states that to some people with certain genetic composition clilantro tastes soapy or like gasoline. So a better explanation rather than just being plain nasty, it tastes different to me. stupid autocorrect hates durian too! I think you really, really may be on to something there, Kim. In all of the descriptions I'd read of this, the people who enjoyed it went on about its complex melding of various flavors, and one even said the same thing you did - they literally wanted to keep eating it until they couldn't eat anymore. Of the few foods I don't enjoy (cole slaw, for instance), I can at least taste something in them that I can understand why other people would like. But my tongue and palate just were not prepared for the experience of durian. I think you are probably exactly right about different people's bodies just receiving it differently. too lazy to reread about your wrap party. are you going to webcast the festivities? The thought had occurred to me, but I'm not sure what the best way to do that would be. I've never webcasted anything before, so I don't even really know the best method/platform to use, although I'm sure it's not that difficult. The other thing is that I'm not sure if it would work out well visually, since I'd have to position a cam with a vantage point that could get most of my living room, dining room, and kitchen at once, since people will be milling around. Your question has sort of resurrected the possibility in my mind, though. also, did you mean "idiot neighbors' dogs," "neighbors' idiot dogs" or a bit of both? i really appreciate your patient, instructive way with Blake. and his patented chimpanzee-freakout-signoff makes me smile. I think I meant both. Seriously, it started with just our next door neighbor's chihuahua, and within seconds every dog in the neighborhood had joined in. And thanks - Blake is definitely my little partner. What I love about him is that he is all the things that I have learned to filter (ie. the signoff). Thanks for the skype idea, too. I'll have to check that out. Danny, my favorite part of Project Gastronome is that I'm not eating any of these things! Plus there's real comedic value in watching you fight through some of the items. In fact, I'm now actively rooting for you to hate everything you taste for the rest of the month. PS - Hobo's feet = hilarious! When I turn off the part of my brain that hates me for feeding it hot peppers, and just watch the videos as a viewer, I have to admit that the best entries are definitely the ones where I'm miserable. you and blake laughed exactly alike over "hobo feet." does that mean he's mature like you, or... well, you get the idea. 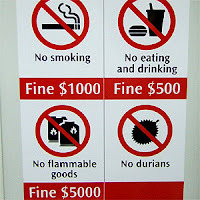 your reaction to durian makes me think your allergic to it! surely, it wouldn't be so beloved if it tasted like flammable vapors and kerosene to everyone!